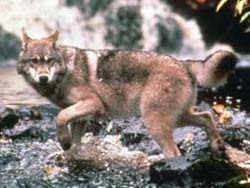 Wisconsin&apos;s policy to manage its wolf population keeps running afoul of outside interest groups. UW Madison environmental studies professor Adrian Treves says the state has combined sound management with democratically achieved consensus. “That statewide process, which took a good twenty years to build up, in one blow was been undermined by procedural detail at the federal level,” says Treves, referring to last month&apos;s decision by a federal judge to put Wisconsin wolves back on the endangered species list. He says outside groups — in this case it was the Humane Society of the United States — don&apos;t participate, but prefer to litigate. “It&apos;s their sort of last resort to get their priorities and their vision dominant over what&apos;s generally a consensus or compromise decision that&apos;s reached by the states,” Treves says. Treves expects the U.S. Fish and Wildlife Service to contest the ruling. “I believe we&apos;ll see an appeal within six months to a year, and possibly the authority for the management of wolves will be transferred back to states and tribes, maybe by the end of next year.” Writing in the current issue of the journal Human Dimensions of Wildlife , Treves suggests that Wisconsin residents voice opposition to outside groups who attempt to shape state policy via the courts, rather than through consensus building and public participation.